Feel the power of the Session 700 in the palm of your hands! 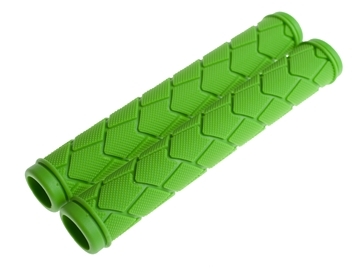 Our BMX handlebar grips are designed using the same aggressive tread pattern as our Session 700 tire so they grip like crazy. 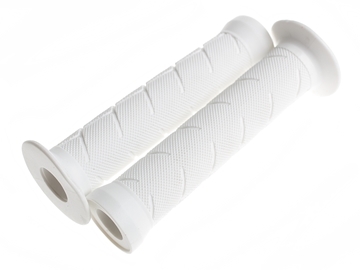 To add a bit more comfort to your ride we re-designed our rubber to make it soft on your hands and super easy to grip. 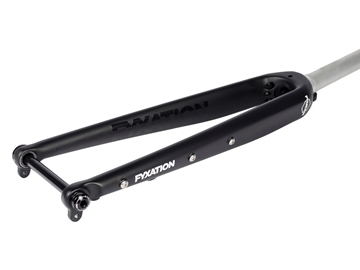 Ideal for any fixed gear rise bar or BMX bike, the Fyxation BMX grips are a great addition to your ride. 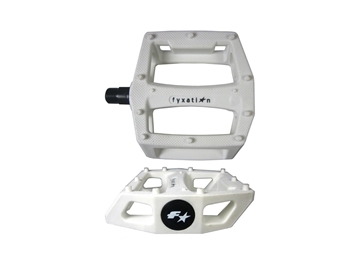 The Gates pedal is a classic BMX inspired pedal with a wide platform and moulded in grip studs. Built to last, the Gates pedal is moulded from an impact grade nylon and will hold up much better than brittle PC alternatives. 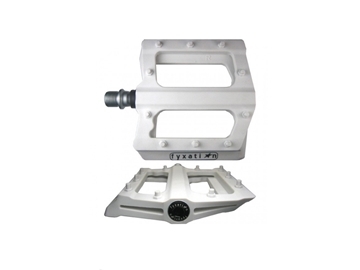 Ideal for commuting, fixed gear, trail riding, and BMX, the Gates is a versatile and reliable platform pedal. 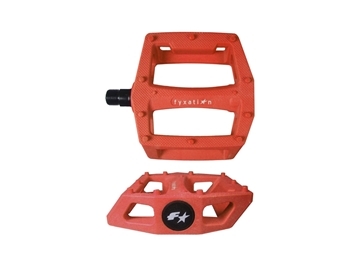 Compatible with most pedal straps and foot retention systems. The Gates Slim combines the Gates BMX platform pedal and thin bodied/sealed bearing Mesa platform pedal into a durable and affordable package. 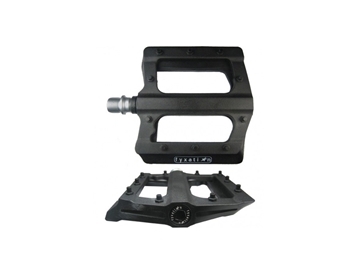 Cr-Mo spindle, rebuildable loose ball bearings, impact grade nylon and a super thin profile should make the Gates Slim an easy choice. 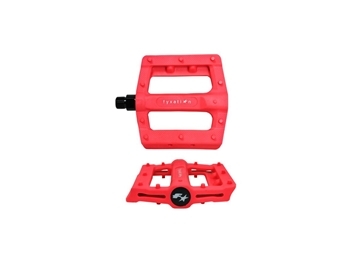 The Gates Slim pedals are ideal for any commuter/city build but is also great for BMX riders looking for a durable, thin and affordable platform pedal. The Gates Pedal Strap is a secure and easy to adjust alternative to toe clips and straps. Made from durable 2" nylon seatbelt webbing and an extra long top strap the Gates Pedal Strap is tough enough for freestyle tricks and comfortable enough for the morning commute. The Gates Pedal Strap was built for all styles of riding and is secure, adjustable and easy to install. Designed to address the short comings of some of the other pedal straps on the market, the Gates Pedal Straps are are easy to install, built with an extra long top strap to fit most shoes/boots and most importantly these straps are affordable! 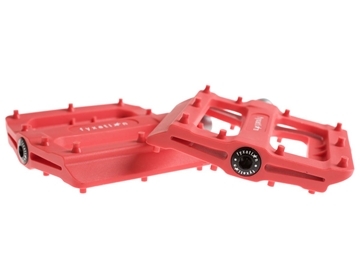 Please note that using pedal retention system as a breaking method is at your own risk. Pedals and straps should be checked regularly. The Mesa MP is a thin profile platform pedal that has all of what you're looking for and none of what you don't. 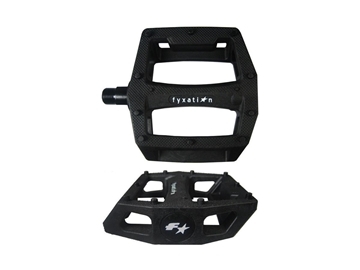 Weighing in at only 351 grams per pair and with a pedal height of a mere 14mm, this impact grade nylon pedal can do it all! While originally designed with a focus on the urban commuter, the nylon bodied Mesa MP has found a home on just as many fat bikes and mountain bikes as it has fixed gears and commuters. It's smooth running sealed bearings, impact grade nylon body, replaceable pins and it's wide 105mm profile make it ideal for any style of riding. 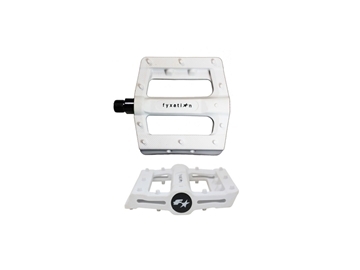 Made out of a high impact nylon and featuring smooth running sealed bearings, the Mesa thin platform pedal is an affordable alternative to expensive alloy platform pedals. 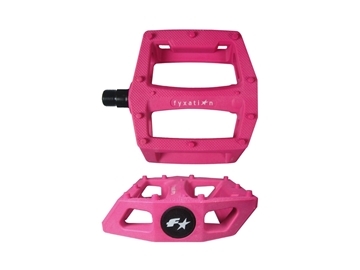 Fyxation Mesa pedal is ideal for freeride, BMX and urban riders that want a hard hitting pedal built to withstand abuse and provide a solid platform for any style of riding. The best way to describe our Snug Bar End Plugs is simply that they do what they're supposed to. That's it. They look great, fit most bars and are far superior than cheaper bar end plugs that comes with your standard grips and bar tape. Snug isn't just a name, it's how these bar ends fit. 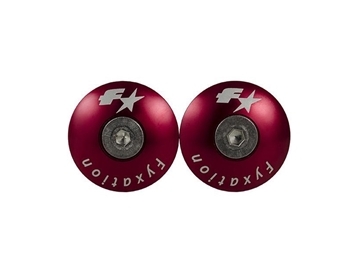 Each set of Snug alloy bar ends, ships with 2 different size spacers so that they fit most handlebars. Simply put them in the end of your bars, tighten the Allen/hex screw to expand the plugs and that's it. These bar ends don't fall out and are a great way to finish off any ride. The Sparta QR All Road carbon fibre fork is ideal for dropping weight and adding tons of versatility to your rig. With cargo/fender mounts, 6 fork eyelets and disc flat mount this carbon fork is built for the city, touring and beyond. It's strong, light, adaptable and is a great upgrade for the rider looking to get more out of their current bike. This adventure ready QR fork was designed as an upgrade for many all road bikes on the market. 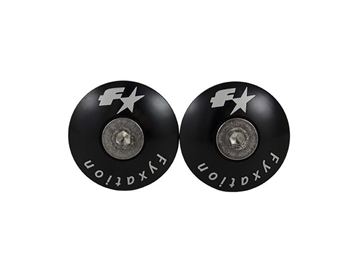 Fyxation Track grips feature a soft Kraton rubber and aggressive grip designed as much for comfort as they are control. These grips are thin, long and are great for track drops or bullhorn bars. 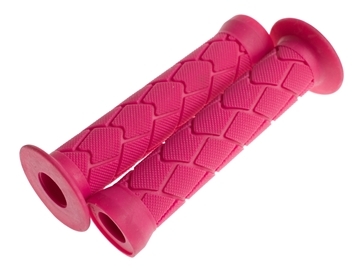 We softened the rubber though to make these bicycle grips super soft and comfortable. 1 1/2" to 1 1/8"